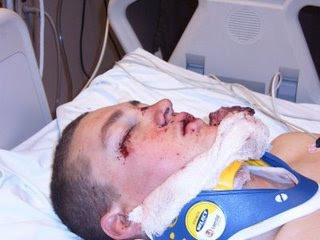 On Wednesday at about 11:30 at night my nephew got in a car accident. So, I had to go stay with the other kids as Brian, Shelley, and my mom were at the hospital. It turned out that he broke almost all the bones in his face, including his upper and lower jaw. At about 3:00 in the morning, they life flighted him up to the U of U hospital. Needless to say we didn't get much sleep that night. So with this all going on, I was kind of put in charge of trying to make a semi-normal Thanksgiving. (Luckily I didn't have to cook the Turkey, that could have been bad!!). I did have to cook the rolls though, and of course a burned the bottom of some. I decorated the table, and did all that I could to make it seem like any other Thanksgiving. Shelley and my mom made it back down just in time for dinner, but Brian spent his Thanksgiving in the hospital. So later that day we brought him left overs so the he could feel like he had a Thanksgiving. So instead of playing games, and hanging out together all day, most of us traveled up to the hospital to visit Scott and be with Shelley and Brian. So this is Scott after he got cleaned up a little. 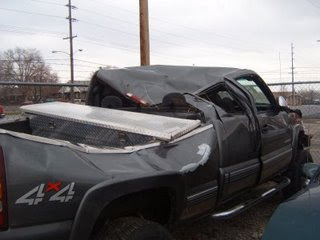 This is the truck that they were in, of course, Scott was sitting in the back, right were the cab of the truck collapsed. He got lucky that things were not worse. We are so thankful for that!! He will be going into surgery today to place plates almost everywhere in his face. He will also have to have his jaw wired shut for 6-8 weeks. He has a long road of recovery to go through. Hey, Molly. My mom called me last night to tell me what happened. I'm so sorry! We love your family and are praying like nuts for them. Good for you for putting together a Thanksgiving dinner. Ever since we moved to AZ we have been hosting family for Thanksgiving and it is REALLY hard! Please, please keep us updated on Scott. Man Molly I am so sorry you had to deal with this last week! I didn't even know. I hope he recovers quickly, and I hope Shelly is okay.